Styled with garrand sweater and tie-front pant . Knit with a superfine alpaca blend from Peru, this sweater is luxuriously soft and textural. The oversized design has a slouchy, laid-back fit. I bought Karlis in habanero because I thought it would double as a sweater dress when fully buttoned - it doesn't, even when sized up, but I still loved it so much that I bought it in blue willow. 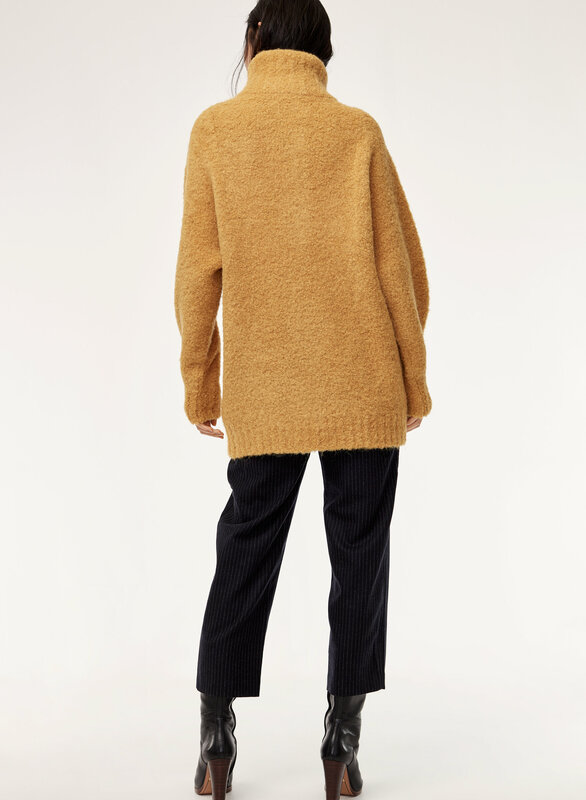 Looks great no matter how it's buttoned, and you can throw on a micro mini and heels to get the oversized (and fabulous) sweater dress look. There were a few small holes (imperfections in the stitch) in the blue willow, but they were easy to fix with the extra thread. I recommend checking before detagging. Love the colour and the look but it’s way way to scratchy for me. Wish I had of returned it because I feel like it’s too scratchy to even wear. I bought the grey, but it looked more light blue. I found the sweater to fit small and would size up. 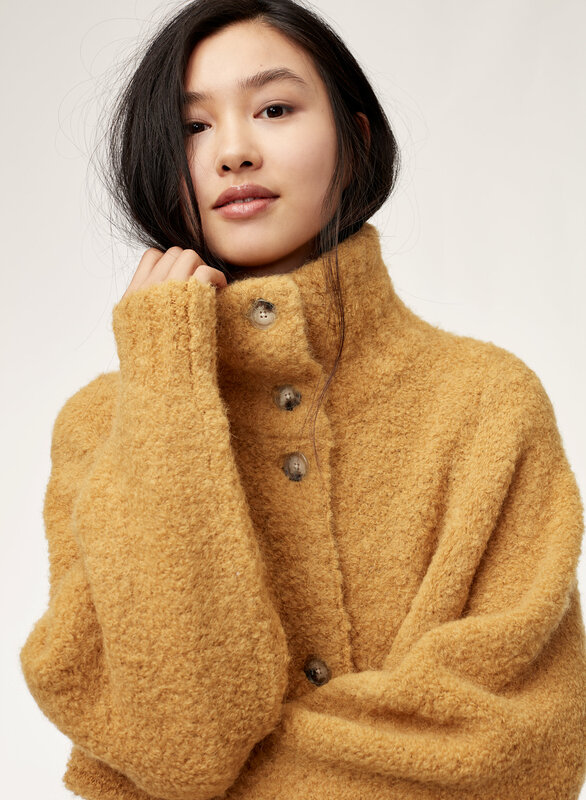 It's like a sweater coat, but softer than you could imagine! The silhouette is definitely oversized, but it adds to it's appeal. 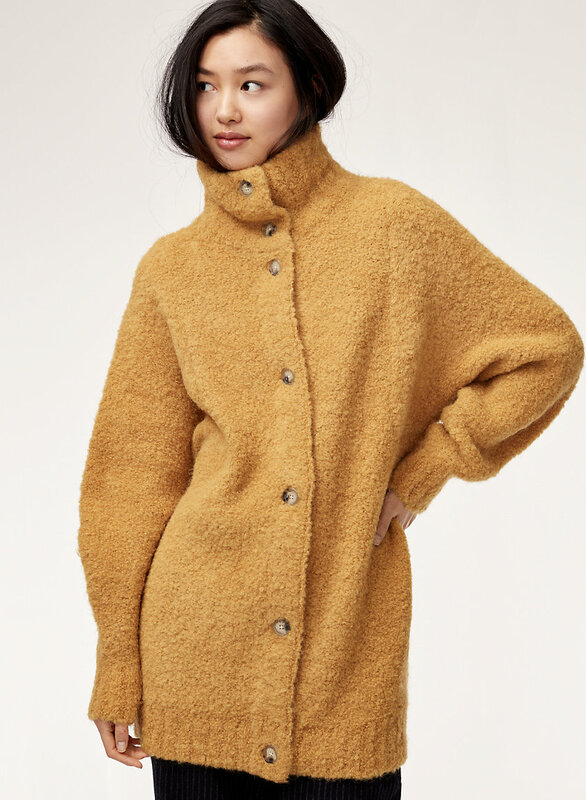 It is really cozy, but a little bulky under a coat. However, I have been really happy with this sweater! Love this cardigan but it attracts so much lint and has started to pill after only wearing it a couple of times. That is my only downfall other than that the cardigan is extremely soft and warm. 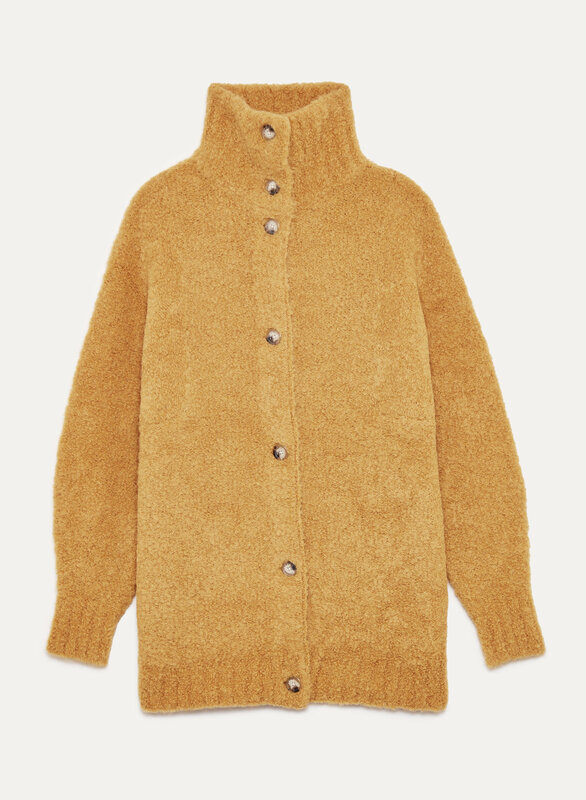 I love the high collar, length, and combination of alpaca/nylon which is soft and cosy. It's modern but classic; versatile with style longevity. I got the Blue Willow in XXS and it fits perfectly. 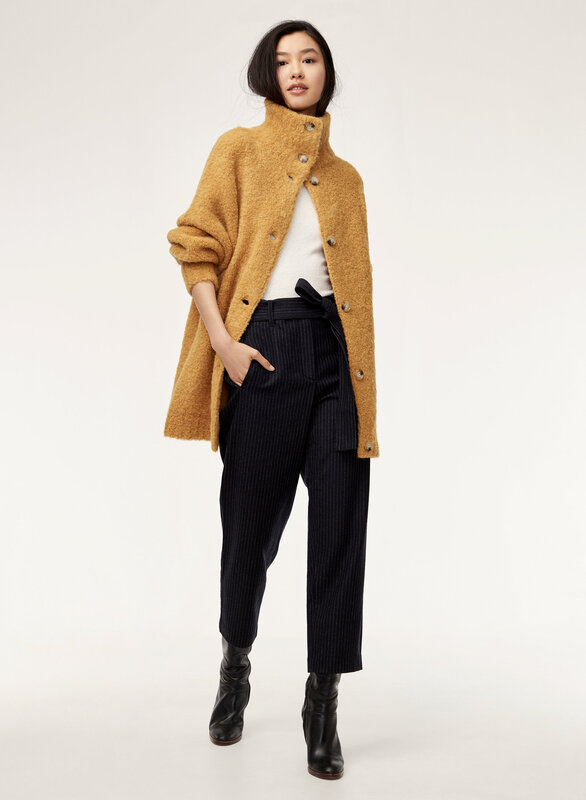 I'm 5ft.The cardigan, for me, is more like a jacket (falls just below my derriere) which is great for warmth, so I'll be wearing it a lot in the spring and fall outside. This sweater is soft, cozy and warm for the cold winter days. 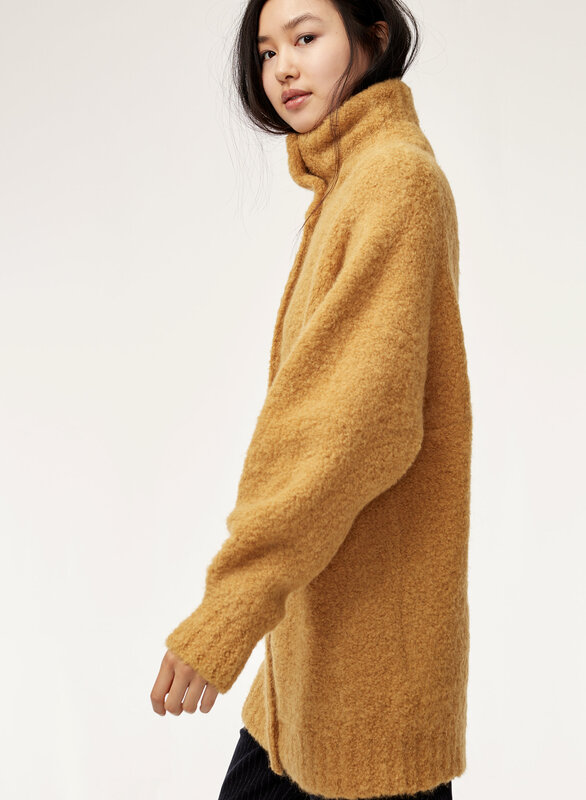 Love this sweater, super cozy and soft. My only issue is that I haven’t even washed it yet and already a lint ball magnet. Makes it look old & used. This sweater is the cosiest!! I love the button detailing on it and the slouchy fit! I purchased the birch and blue willow color, and clay mask.. they’re all lovely colors! I would definitely reccomend you snag one before they sell out again!